Apparently it was Pablo Picasso who surmised that "Art is the lie that tells the truth," and I suppose that little play on words is true more often than not. But in the case of "The Farnsworth Inventions" -- which has recently been revived in Chicago, "art" is the lie that perpetuates a lie. This past weekend, Chicago's Timeline Theater -- so named because it presents mostly plays that are "inspired by history" -- opened the latest regional revival of Aaron Sorkin's play, which had a relatively brief run on Broadway starting in the fall of 2007. Over the past few days I have read several reviews of the play, which I am certain is well produced, skillfully directed, powerfully acted, and altogether a satisfying amusement for those in the audience who can be patient with the sort of dense dialog that it takes to convey such a complex subject. I really wish to take nothing from those valiant thespians who have taken it upon themselves to successfully mount a challenging production; judging from the reviews, they have all done their job well and I wish there was some way to convey the sincerity of my congratulations in that regard. ...Act two finds its footing, brings the play to a resounding conclusion and teaches a piece of history that many people my age know little to nothing about. ...I just have to say "stop the presses." Because if the conclusion of this play is "teaching a piece of history that many people... know little about," then what they are learning is, to put it mildly, patently false. The irony in this particular review (by one Jake Lindquist) and others like it is that it suggests that the play "finds its footing" at precisely the point where -- historically speaking -- the wheels come off. 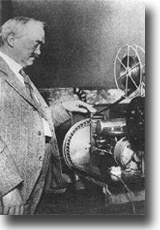 The "resounding conclusion" of which Mr. Lundquist speaks is the verdict rendered at the end of a courtroom scene in which "priority of invention is awarded to Vladimir Zworykin" -- the RCA engineer who attempted with patent litigation in the 1930s to claim that he had come up with Farnsworth's invention" before Farnsworth did. But the fact is that in the pivotal litigation portrayed in this play (and indeed essentially all of the litigation in which Farnsworth was involved), "priority of invention" was awarded to Philo T. Farnsworth. I understand what playwright Aaron Sorkin is trying to do here. 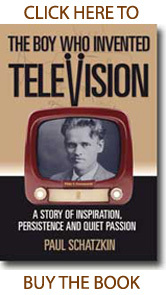 He's trying to make the point that Farnsworth "lost television," as his character says in the penultimate scene, a well-imagined encounter between Farnsworth and his dramatic antagonist, RCAs David Sarnoff. And I suppose a case can be made that, historically speaking, Farnsworth did "lose television" -- as the historical ignorance of this and most other reviewers of the play readily attest. These reviewers -- and, unfortunately, most of the audience -- having no prior knowledge of what actually happened behind the scenes during the 1920s and '30s, have no way of knowing that Farnsworth actually won the litigation that is portrayed in this drama, or that the actual historical outcome is completely reversed in the "resounding conclusion" to this play. Likewise, the audience has no way of knowing that the play's portrayal of Farnsworth's ineptitude at resolving his "light problem" is equally false, that the ultimate technical solution that made Uncle Milty and his brethren possible in the forties and fifties was in fact based on one of Philo Farnsworths' many patents. 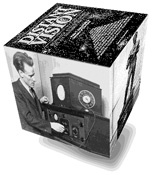 Nor does the audience have anyway of knowing that the actual outcome of the patent litigation in the 1930s compelled RCA to take a license for the use of Farnsworth's patents -- or that that was the first time in the company's history that it had ever accepted -- and paid for -- such a license. Indeed, if it were not for such facts as this play omits and neglects, there would be no reason to have such a production in the first place. What this play does is complete negate Farnsworth's contributions, reduce them to historical irrelevance by declaring that 'priority of invention' was ultimately awarded to Farnsworth's well-funded rival. That may indeed be the judgment of history, but it was NOT the judgment of ANY of the litigation that actually transpired. Aside from Picasso's observation about art, lies, and truth, it has also been said that "history is written by the victors." That appears to be the case with The Farnsworth Invention. 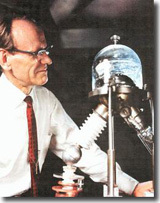 This idea that Farnsworth's contributions were novel but irrelevant, that his inventions were plagued with a "light problem" that he could not solve, and that television marched on without him -- that has been the party line delivered by RCA's PR machine for going on seventy years now. According to the RCA version, Farnsworth's Image Dissector camera tube was fatally flawed, and only the "storage principal" supposedly introduced by Zworykin at RCA (and even that point is debatable) made real television possible. Unfortunately, that is essentially the "resounding conclusion" that The Farnsworth Invention leaves its audience with: that Philo Farnsworth as an inept, alcoholic loser who stumbled on to one good idea and couldn't even hang on to that. The fact is that Farnsworth's contribution was an achievement of epic proportions that paved the way the entire video universe we live in today -- but you will not find that "resounding conclusion" anywhere in the two hours of this or any other production of The Farnsworth Invention. Very good site-good history! 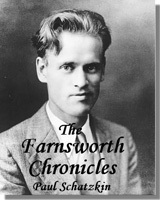 Philo Farnsworth was a relative of mine-not sure by what; cousin, niece, etc? Nice to see Truth published out of the lies.